The College of Saint Rose takes pride in serving the alumni community—more than 42,000 of you and growing! Whether you graduated 5, 10 or 55 years ago or more, we’re sure that you will find value in one or more of the following benefits offered exclusively to Saint Rose alumni. We invite all Saint Rose alumni to access our Libraries, and Computer Labs, by participating in The Saint Rose Fund, with an annual gift of $30 or more. To access the Fitness Center and Pool a minimum gift to The Saint Rose Fund of at least $100 is required. All gifts to The Saint Rose Fund help to keep Saint Rose at its best through scholarships, financial aid, campus improvements, and other unique educational experiences. You may make your gift through the mail, by phone, by credit card through the “Opportunities for Support” page, or by visiting the Office of Alumni Relations (979 Madison Avenue, Moran Hall, First floor). Once your gift has been processed, you will receive an Official Receipt which you may present at the ID Card Office, so that your Golden Knights Identification Card can be issued. Use your Golden Knights Identification Card to swipe into the Fitness Center, borrow library materials, and access other key areas of campus. Your Golden Knights ID card will become inactive twelve months after your Saint Rose Fund gift, but can become easily reactivated by making a gift to The Saint Rose Fund. Alumni Application Fee Waiver – Saint Rose alumni may apply for acceptance into Undergraduate or Graduate programs free of charge. Call 1 (800) 637-8556 for more information. 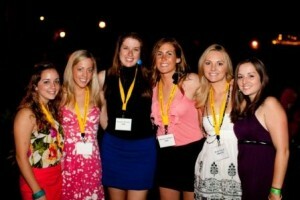 Alumni Event Invitations – Saint Rose alumni will receive invitations and e-vites to local and regional Alumni Events. Alumni Family Scholarship Opportunities – The Monsignor Delaney Family Scholarship is awarded annually to two first-year Saint Rose students who are the spouse, child, grandchild, sibling, niece/nephew or cousin of a Saint Rose graduate. Your Saint Rose degree even benefits your relatives! For information on eligibility and deadlines, or to obtain an application for the Monsignor Delaney Family Scholarship, call the Office of Alumni Relations at (518) 454-5105 or send an e-mail to alumniassociation@strose.edu. Annual Invitation to HOME.COMING & Family Weekend – All alumni are invited to attend a weekend of reminiscing, reconnecting, and reliving Saint Rose memories. Each year, this event marks a trip back to campus for hundreds of alumni, students and their families. Complimentary Lifetime Subscription to Saint Rose Alumni E-Blasts – All alumni whose most current e-mail address is on file at the College receive monthly Alumni E-Blasts from Saint Rose, complete with campus news updates, exclusive e-vites to Alumni Events, and more. Complimentary Transcript Requests – Saint Rose alumni may take advantage of 20 complimentary transcript requests. A fee will be charged for each transcript beyond that. Click here for more information or contact the Registrar’s Office at (518) 458-5464. Exclusive Audit Discount – For just $100 per course, Saint Rose alumni may register for any auditable course in which there is an available seat on the last working day before the semester begins. Contact the Registrar’s Office at (518) 458-5464. Free Lifetime Membership in The College of Saint Rose Alumni Association – Under the leadership of an elected board, the Alumni Association represents the needs of all alumni to the College Community, awards scholarships to deserving students, supports student programs, and provides volunteer opportunities for Saint Rose alumni and students. Great Escape Alumni Discount – As an Alum of The College of Saint Rose, we are happy to offer you a discount on tickets and season passes at Great Escape. To redeem, visit https://www.sixflags.com/greatescape. Click on ENTER PROMO CODE in the upper right corner of the screen at checkout and enter promo code STROSE. Liberty Mutual Auto and Home Insurance – Your alumni benefits include a special discounted rate on Auto and Home Insurance from Liberty Mutual. We’re proud to provide Saint Rose Alumni with a great benefit from a Fortune 100 company that protects millions of people across America. Find out more about Liberty Mutual Auto and Home Insurance. New York State residents can contact Christin Zorda, Sales Representative, at 888-443-7548 Ext. 51748 or at Christin.Zorda@LibertyMutual.com. Discounts and savings are available where state laws and regulations allow, and may vary by state. To the extent permitted by law, applicants are individually underwritten; not all applicants may qualify. Career Services – Saint Rose alumni are invited to take advantage of career counseling, resume review, credential file services, the Career Advisory Network (CAN), Education Expo, and other services and resources offered by the Saint Rose Career Center. Visit the Career Center for more information. Prospective Student Application Fee Waiver – With the signature of a Saint Rose alumna/us on their Application for Undergraduate or Graduate Admissions, the application fee for any prospective student is waived. Tuition discount at the Nursery School at Saint Rose – Members of the Saint Rose community including faculty, students, and alumni are given a 10% tuition discount at The Nursery School at The College of Saint Rose. Only one discount is given per eligible family. Voting and Nomination Privileges – As a member of the Alumni Association, you are eligible to become a voting member in the biannual election of officers. Additionally, you may submit nominations each year for the Distinguished Alumni Award and the Thomas A. Manion Distinguished Faculty Award. To become a voting member of the Association or to make a nomination for the Distinguished Awards, contact the Office of Alumni Relations at (518) 454-5105 or send an e-mail to alumni@strose.edu.